Pupils in the Junior School at Abbey Gate College near Chester have sent in a list of questions via their Head Teacher Mrs Marie Hickey. The full list of questions can be seen here: Donkey questions for Mr Thomas and I shall take the opportunity to re-post some earlier photos from the blog while answering the questions. To make it easier I have re-ordered the questions and sometimes joined them up. 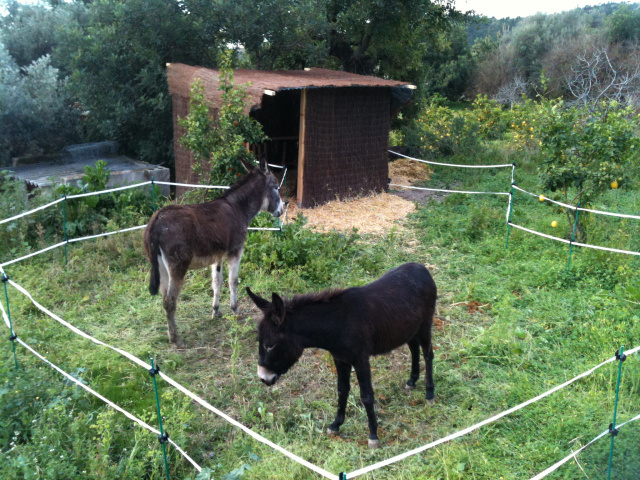 Where do the donkeys sleep? 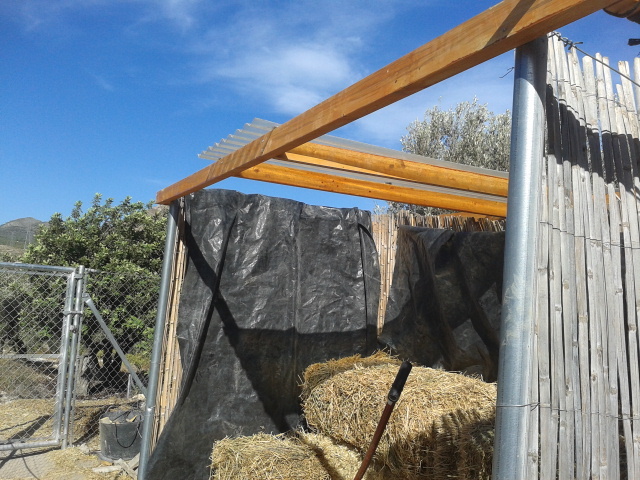 Originally I built a stable for Matilde and Rubí out of timber and brushwood which I thought would be ecologically friendly. 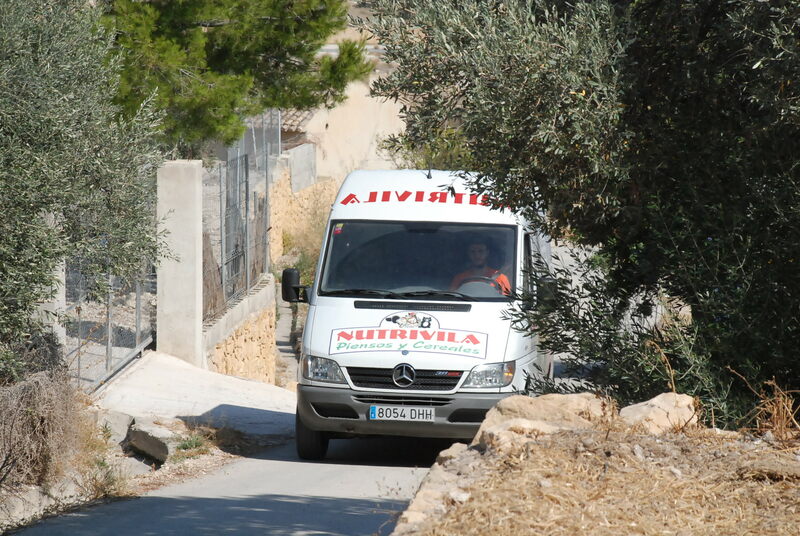 It was so ecologically friendly that Matilde and Rubí had eaten most of it within a couple of months. They thought the brushwood was delicious and they also chewed the timber frame of the stable. 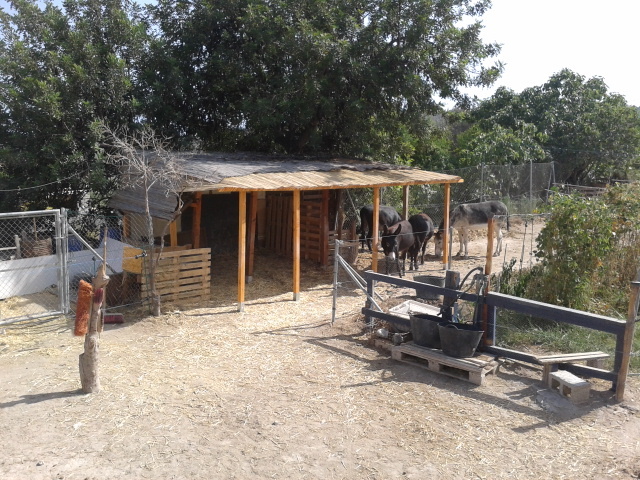 The stable had to be protected with a chain-link fence on the outside and inside to stop them eating it. 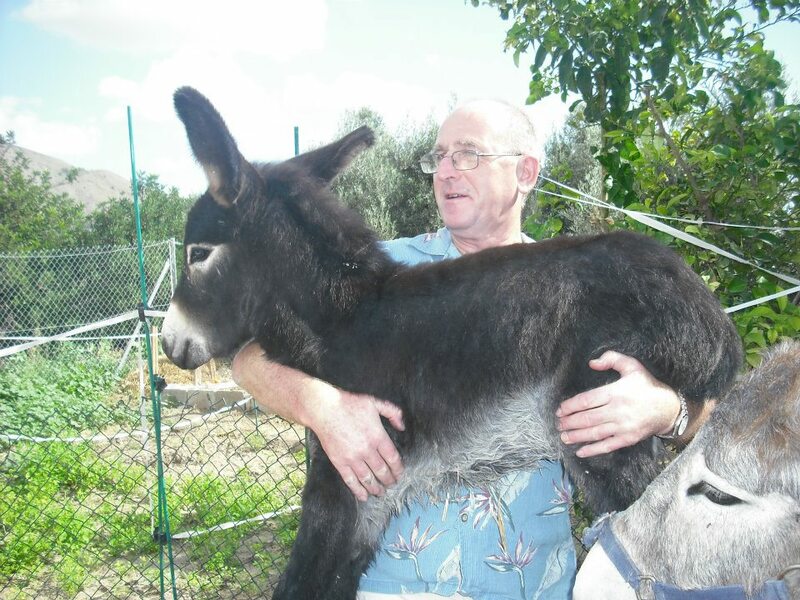 After their foals were born the stable needed to be bigger and I made it a bit longer; then the foals grew up into adult donkeys and the stable needed to be even bigger, so I made it twice as wide! What do you feed your donkeys? How many times a day do they eat? Are they greedy? What sort of treats do they like? 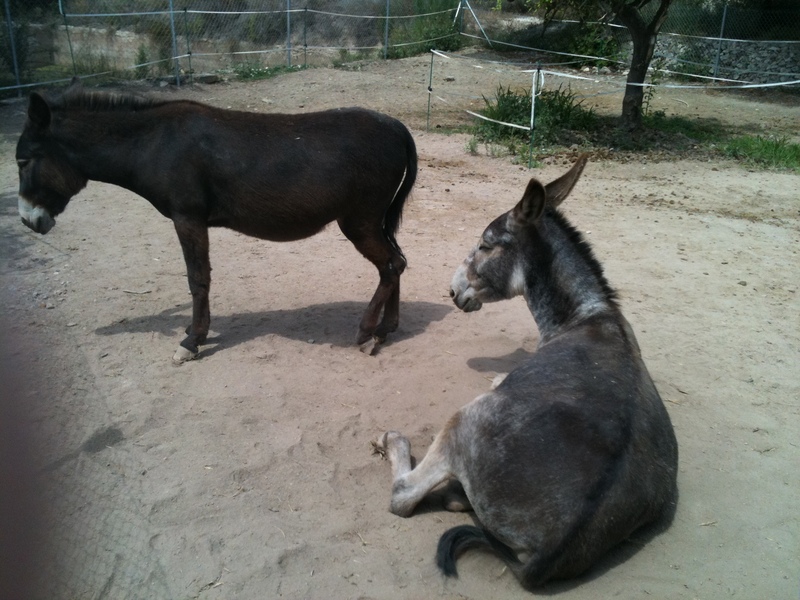 Do the donkeys have different diets? Every month a van delivery brings 14 bales of straw and 8 of alfalfa and 5 sacks of grain. 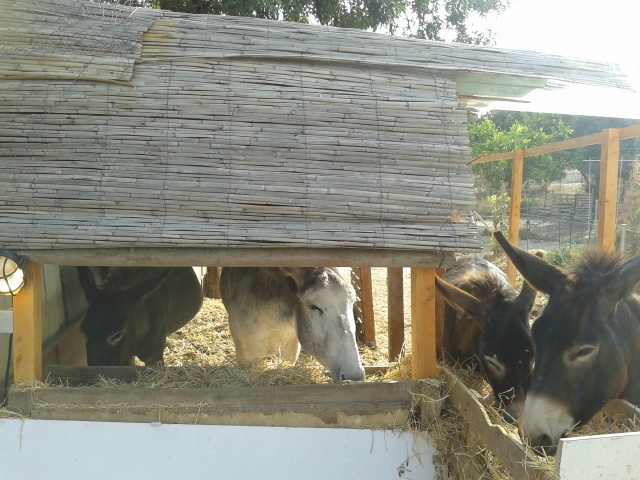 The donkeys have a mixture of these things twice a day, but the bulk of their diet is straw. Donkeys do not need much protein and they should not eat too much or they can become obese and that is bad for their health. They are greedy and will always pester me for food even if they have just eaten. They like treats of carrots and apples. Matilde sometimes has a few sips of beer when she walks with me to the village and we stop at a bar. Beer is made from malt grain, so it has a taste similar to straw. They all have the same diet but Aitana sometimes doesn’t want to eat carrots! In winter when the carrots come out of the fridge I have to warm them in the microwave because the donkeys don’t like cold carrots. How did you feel when you realised they were pregnant? How do they cope in the heat? My main feeling when I realised they were both pregnant was worry about how to help deliver the foals when the time came, but I should not have worried very much as the two mothers knew what to do. They found it quite difficult in the summer heat when they were pregnant: the photo above shows Rubí and Matilde in the summer of 2011 before they had their foals. Morris copes with the heat by putting a T-towel on his head. 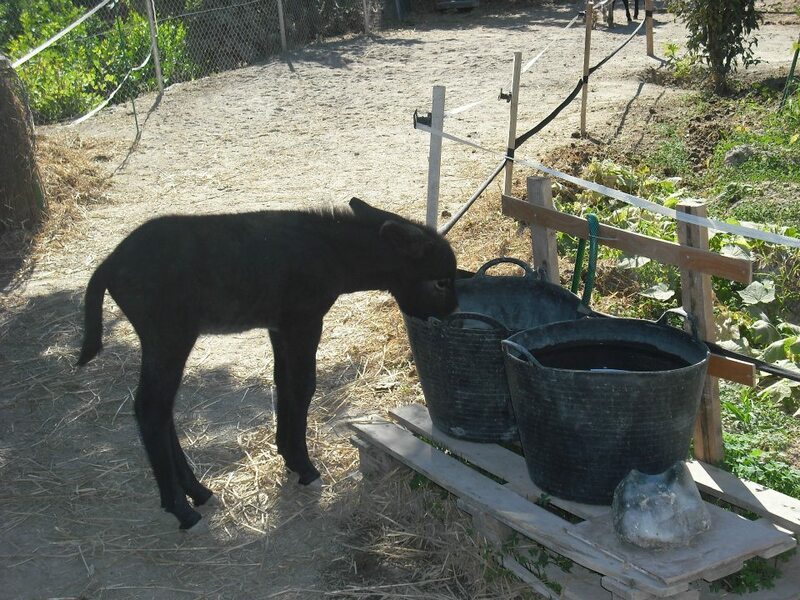 Here are two photos of Aitana and Morris when they were foals. 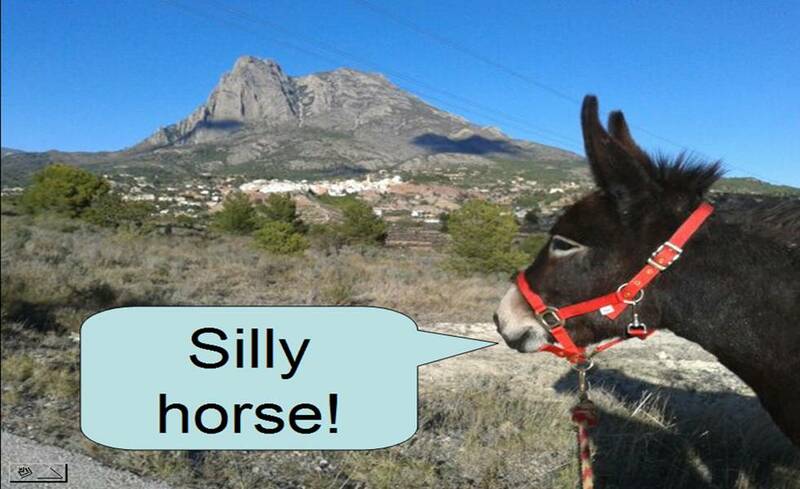 Are the donkeys mischievous? What sort of mischief do they get up to? The main mischief with donkeys is their amusing little habit of destroying anything they find, usually trees. Trees must be protected or they will eat the leaves, the fruit and even the bark. Once the bark has been eaten the tree will die. 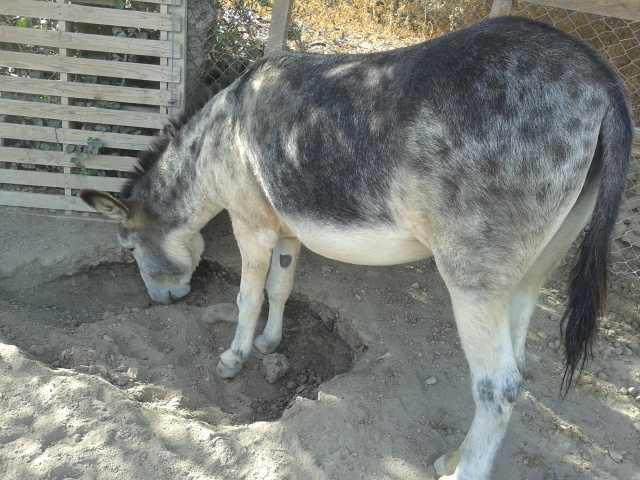 Even when the trees are protected, the donkeys will dig down and try to eat the roots: here are two photos of Rubí and Matilde in action digging at the roots of a carob bean tree. The holes must be filled in regularly, then they just start digging again. They scrape with their hooves and a hole this big can be dug in as little as one day. For how long do you take your donkeys for a walk? Do donkeys wear shoes like horses? Do they have a favourite walk? Can you ride your donkeys? Do your donkeys like swimming? Walks can be anything from an hour to all day. 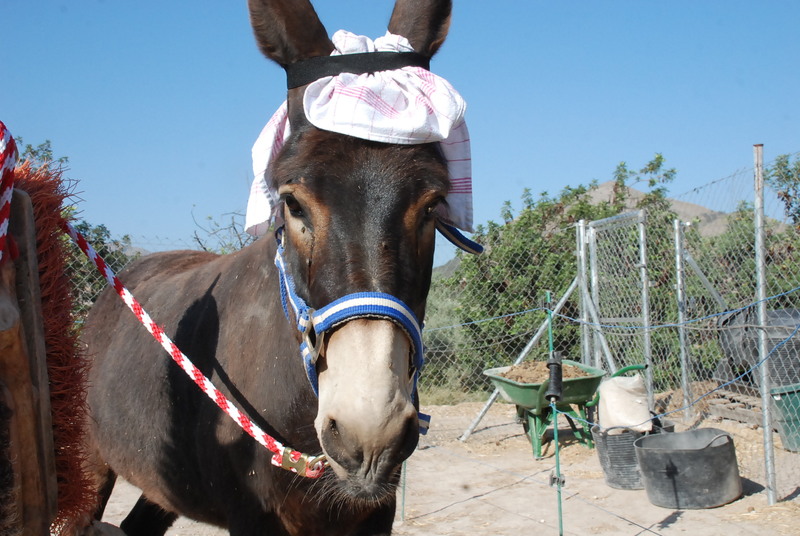 I do not put shoes on my donkeys and many people these days avoid putting shoes on donkeys or mules or horses because it is generally better for their health to have natural bare hooves. 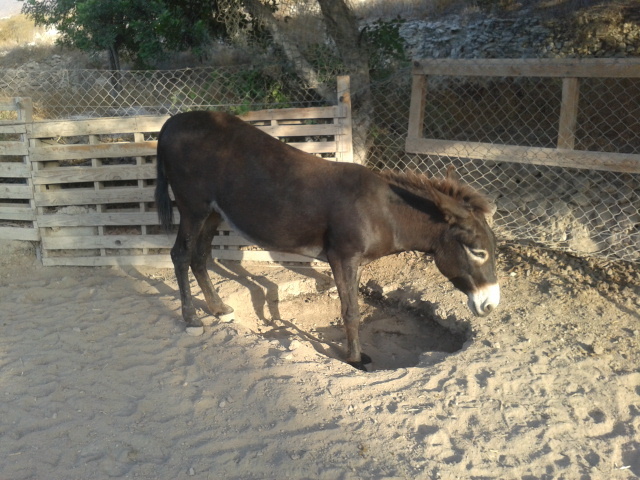 I do not ride the donkeys but one day Matilde might be trained to ride, as she is quite big. 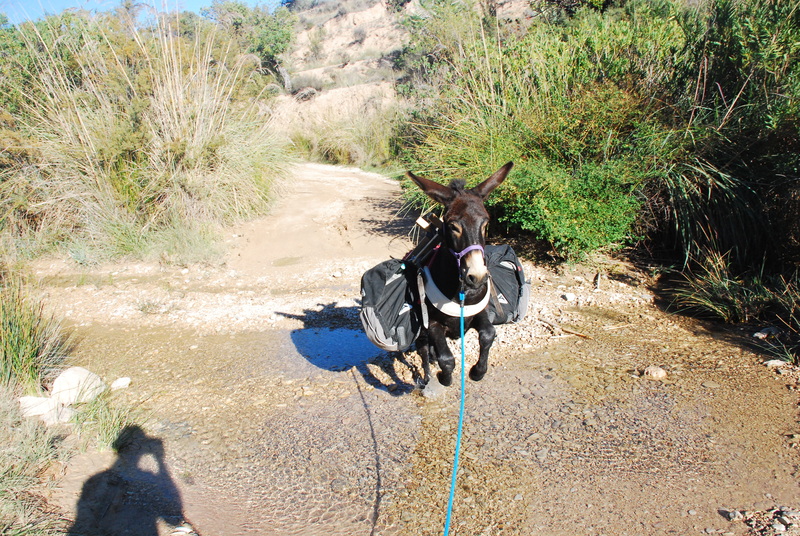 All donkeys hate water. Here is a picture of Morris leaping a stream to avoid getting his feet wet! Well, I think I have answered most of the questions, but the one question you didn’t ask me was “Why do you like donkeys?” and that is quite an easy one to answer: they are totally adorable! We have a saying: Donks don’t stumble twice over the same stone. Meaning: Having an excellent memory for not making the same mistake. Have you noticed that quality in your quartet? Is there a similar expression in English? Thanks for answering our questions. I’ve enjoyed looking at your blog! 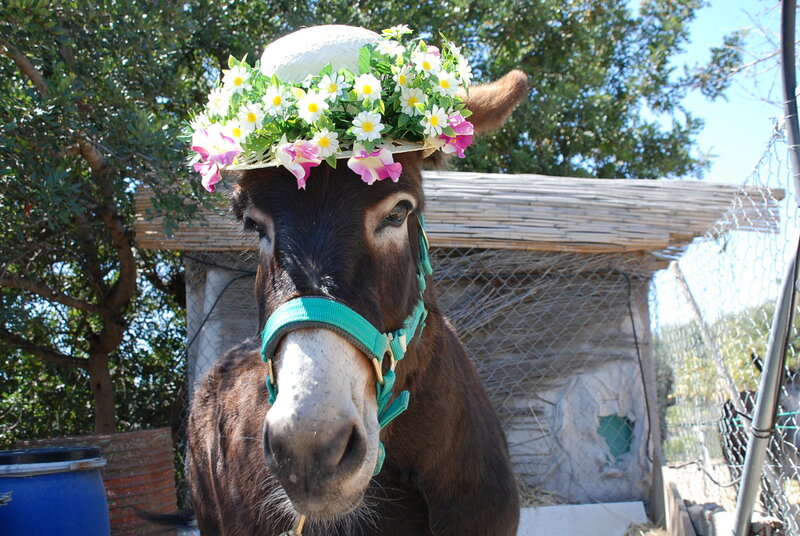 That’s quite all right: I’m glad you enjoyed looking at the blog and the donkeys.